A few posts back we had talked about one of the most commonly used tech support statistics, First Call Resolution and how it can be subject to abuse. 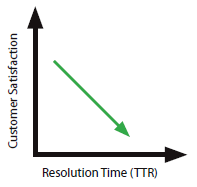 Another important statistic in the tech support world is Time to Resolution, or more simply Resolution Time, but abbreviated TTR. Resolution time is just what it sounds like: the length of time it takes to resolve the customer’s problem. And as you can imagine, the more time it takes to resolve a customer’s problem, the lower the customer satisfaction. If you like pictures, here is a graph that shows the relationship visually. When the customer has a problem, you and the customer have the same goal: to resolve that problem as soon as possible. When something isn’t working correctly, customers want to get back to work as quickly as possible. For your company, the longer the support call, the more costly. Of course, you don’t want to drive the cost of support down at the expense of quality or even perceived quality. If the customer thinks that they are being rushed off the phone, or that their email was not responded to properly, then lower TTR will NOT result in greater customer satisfaction. TTR, like its cousin FCR, is easily subject to abuse and misuse. So here are some ideas about right and wrong ways to use TTR. You can measure this statistic for your team, and then give appropriate training and better tools. Then measure again. If your TTR goes down, this is one measure of whether your training is effective. Reps with below average TTR times are often, but not always your better reps. The same logic applies with reps with higher than average TTR numbers; they may be your least productive reps. It’s important to look for outliers as well. If one rep has far lower TTR numbers than the rest of the team, be suspicious, and monitor those phone calls. Find out the behavior that is causing the difference. You may have an overworked rep that is cutting corners and threatening customer satisfaction. How Can TTR go wrong? Compare one team to another (unless they handle exactly the same calls). Your customer service team has an average TTR of six minutes, and your tech support team an average TTR of 8.5 minutes. Is the customer service team a better team, better trained or managed? Probably not, since their jobs are very different. To state the obvious, tech support calls require technical skills, and are usually more complicated. Even two different tech support groups probably aren’t handling the exact same products, with the same type of customers, under the same escalation rules. So you can’t compare their TTR times directly. Just as you can’t compare different internal teams on their TTR, and you can’t evaluate two different tech support vendors by comparing their overall TTR. The vendors will be supporting different products and have different escalation rules and instructions from their client. Even similar products may have a completely different mix of problems affecting TTR. One product may be relatively bug-free; the other product may have lots of bugs. Incentive reps on TTR (link compensation to this statistic alone). You change people’s behavior when money is involved. TTR should come out of good call center practices, good training and good coaching. You don’t want your reps too eager to get off the phone and mark the call resolved, just to get their TTR down to meet a goal. Also, that rep who is slightly above average on TTR? She may be a very good rep, who is just more methodical than the rest of your reps. Reduce her compensation and you may reduce her effectiveness, and even lose her. We think it is a mistake to add different channels up and take averages. Chats have typically shorter TTR than other channels, but are not necessarily as productive for complete customer satisfaction. An email is like a conversation, possibly going back and forth several times, and you have less idea when it is actually complete. You may go a week and not hear from a customer, and then find out the incident is still not resolved. On a phone call, you have the chance to more fully understand the customer’s problems during first contact and solve them. So the channels don’t give comparable numbers. We would measure them separately. One particular caution about email. To get email TTR as short as possible (and to give faster service), some call centers send out general information to most inquiries and hope the user will find what they need. If they don’t hear back from the customer within a certain number of days, they mark the incident resolved. This may be acceptable business practice for higher volumes or during seasonal volume spikes, and the email incidents will have an attractively short TTR, but remember that customer satisfaction from these kind of non-personalized responses won’t be the same as a careful email response from a rep, or a telephone call with an agent. In short, the right way to use Time to Resolution is internally, measuring your group over time and comparing individual reps against the norm, to see who needs training and tune-up. Measure TTR separately for each channel. Work to lower TTR by good call center practices, but don’t tie anybody’s compensation to this statistic or any other single number. Who Talks to Your Customers? We are Hudson. We know support.